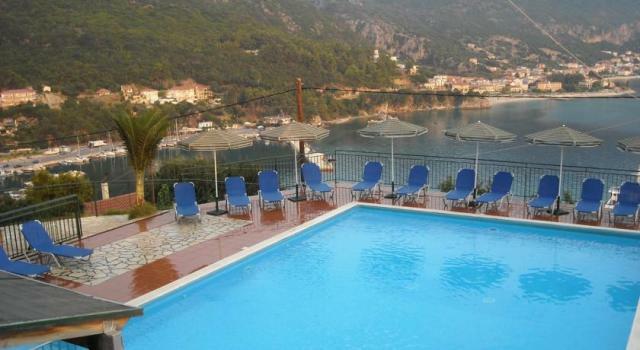 is built in the village of Poros by the sea, with the greatest view of the Ionian Sea. The village of Porosis situated in the most lush and greenest part of the island, in southern Kefalonia, stretches along the beautiful seashore. It is one of the main harbors on the island, harmonically constructed at the foot of the mountains Pahni and Atroswith views of the mountain and the deep Ionian Sea. The area is renowned as a fishing place, while its caves are a shelter for the seal Monachus-Monachus and the turtle Caretta-Caretta. The ravine of Poros is one of the most beautiful geological phenomena of Kefalonia. The residents are quiet, considerate, decent and honest, for this reason Poros is known for its hospitality. All rooms in the hotel withbalconiesfurnished with high aesthetic and equipped with: refrigerator, phone, music, AC, room for breakfast, bar, swimming pool and parking space.